The Endless River represents a return to the creative principles that informed the writing process that produced Pink Floyd classics like Echoes, Shine On You Crazy Diamond and Animals. In early 1993, David Gilmour, Nick Mason and Richard Wright set up their equipment in their own Britannia Row Studios in Islington and created more than hundred pieces of music by jamming together, interacting with each other's performances and recording the results. They then honed the pieces at David's Astoria floating studio, played them live for 2 days at Olympic Studios in Barnes with an extended lineup (Guy Pratt on bass, Jon Carin on keyboards and Gary Wallis on percussion). After that, the core trio returned to Astoria, and worked further on the compositions, alongside co-producer Bob Ezrin, refining the structure, tempos and arrangements. The result, after lyrics and vocals were added, was the 12 million selling 'Division Bell' album. At the time, there had been talk of a separate ambient album being created from the non-vocal tracks not subsequently issued on 'The Division Bell', but the idea was eventually dropped. In 2014 David Gilmour and Nick Mason re-entered the studio and, starting with unreleased keyboard performances by Richard Wright, who sadly died in 2008, added further instrumentation to the tracks, as well as creating new material. The result is The Endless River, including 60% of recordings other than the 1993 sessions, but based upon them. 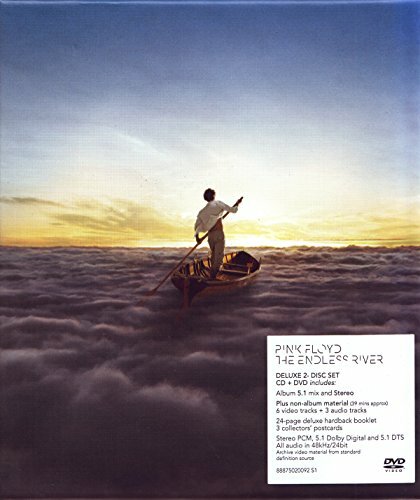 The title is a further link, '... the endless river...' being part of the closing phrases of High Hopes, the final song of the previous Pink Floyd album. David Gilmour describes the record as follows: "The Endless River has as its starting point the music that came from the 1993 Division Bell sessions. We listened to over 20 hours of the three of us playing together and selected the music we wanted to work on for the new album. Over the last year we've added new parts, re-recorded others and generally harnessed studio technology to make a 21st century Pink Floyd album. With Rick gone, and with him the chance of ever doing it again, it feels right that these revisited and reworked tracks should be made available as part of our repertoire." Stylistically, The Endless River includes all of the musical elements that characterize Pink Floyd: mellifluous keyboards, jazz-tinged drums, musique concrete, ethereal vocals, and distinctive, emotional lead guitar. As well as Pink Floyd's trademark backing vocals, there is one vocal track, with lyrics by author Polly Samson, who also contributed to The Division Bell.